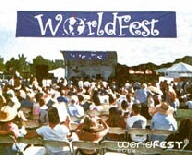 Come celebrate the very best of nature and humanity at World Fest 2002. This gathering of nonprofit organizations, empwering speakers (Julia Butterly Hill, Ed Begley Jr, Casey Kasem, Linda Blair and more), earth-friendly and animal friendly products, holistic health services and delicious healthy food should prove to be very worthwhile. Bring your friends and family and enjoy the day! Includes one FREE raffle ticket for a Ford TH!NK electric vehicle, courtesy of Galpin Ford!